CHATTANOOGA, TN--(Marketwired - Feb 18, 2015) - One out of every three people age 65 or older suffers from hearing loss, according to the Hearing Loss Association of America. For these individuals, the nearly 48 million Americans with hearing loss, an innovative new captioning telephone was unveiled today that ensures phones conversations are clearly understood and once again enjoyable. 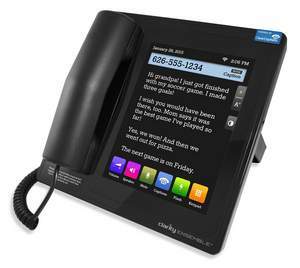 Clarity -- a division of Plantronics (NYSE: PLT) -- and ClearCaptions launched the second generation of Ensemble, a captioning phone that displays text of conversations in near-real time on a large color touchscreen while also amplifying voice so users can see and hear what callers are saying. "If you have hearing loss, phone conversations can be frustrating and have a large impact on feelings of isolation and disengagement," said Carsten Trads, president of Clarity. "We've teamed up with ClearCaptions to create a sophisticated home phone using the latest in tablet technology, captioning and amplification to make conversations more accurate, understandable and ultimately enjoyable for millions of people across the U.S. For these individuals, this is really much more than a phone -- it is a lifeline connecting them with the world." When an individual places or receives a call on Ensemble, the other party's words are transcribed through ClearCaptions, a Federal Communications Commission (FCC)-certified telephone-captioning service that is similar to closed captions for television. As the user listens, the conversation automatically appears on Ensemble's touchscreen display in a large, easy-to-read font. There is no fee for using the ClearCaptions service. Through Ensemble's Call Log, users can go back to previous conversations to review what was said -- a helpful feature to ensure details, such as addresses, phone numbers or doctor instructions, are not missed. Additionally, Ensemble's loud and clear speakerphone allows for hands-free conversations where individuals can use both ears to hear the caller while also reading the captions. "If you have hearing loss, captioning is vital to normal life," said Bob Rae, CEO and president of ClearCaptions. "Whether it's a conversation with a doctor or a call with a financial advisor, ClearCaptions on the Ensemble makes it absolutely certain that you hear and understand the conversation correctly. In the end, that not only means you can understand the medication instructions from your doctor, but you can hear about your grandchild's day, listen to loved ones wish you happy birthday or simply enjoy a chat with an old friend." Ensemble's intuitive touchscreen interface is simple and easy-to-use. The phone is also equipped with voicemail. Users can play back messages with live captioning to ensure they don't miss instructions, phone numbers or other important information. In addition to captioning, Ensemble amplifies the incoming voice so users can clearly hear and understand the conversation. It features a patented digital sound processing technology that functions like a hearing aid to make soft sounds audible and keep loud sounds in a comfortable range. Users can adjust the tone or amplification settings to customize Ensemble to their unique degree of hearing loss. Ensemble, powered by ClearCaptions, can be purchased at www.clearcaptions.com/buynow for $75. High-speed Internet and landline service are required for Ensemble. Clarity, a division of Plantronics (NYSE: PLT), creates smart communication solutions that help seniors live richer, more engaged lives. For more than 40 years, Clarity's innovative products -- such as amplified telephones, notification systems and assistive listening devices -- have helped people with hearing loss, low vision, limited mobility, dexterity issues and other health challenges. Clarity has pioneered many firsts -- from digital sound processing in 2005 to remote-access customer service in 2010. Millions rely on Clarity to communicate at home, at work and throughout their lives. For more information, please visit www.clarityproducts.com or call 1-800-426-3738. ClearCaptions helps millions of people with hearing loss across the U.S. stay connected with the outside world. ClearCaptions is a Federal Communications Commission (FCC)-certified telephone captioning provider that was founded in 1997. ClearCaptions provides an innovative suite of captioning services through a variety of platforms, including personal computers, mobile devices and home phones. For more information on ClearCaptions, visit www.clearcaptions.com.